In this blog I will cover three variations of the side lying leg lift exercise. Let’s start with the Side Leg Lifts exercise. The side leg lifts exercise is a beginner level Strength exercises in the Exercise for Better Bones program. This exercise targets the abductor muscles (the muscles of your upper hip and buttocks) and the hip bones. This version of the side leg lifts exercise is a beginner level strength exercise. Here are the step-by-step directions you should follow to complete this exercise. An exercise mat or a comfortable carpet is advisable when doing the side lying leg raise exercise. You want to have a small towel that you’re going to place at your waist so that when you lie down on your side, the towel fills in the space. You can either use your arm for support underneath your head or a pillow. You’re going to comfortably bend your bottom knee and your top knee is going to be straight in a line behind you. What I’ve done is mimicked as if I was up against a wall. My heel would be in that same line as my torso up against that wall. My top hand I’m going to place right in front of me, and I’m going to allow myself to roll into my hand ever so slightly so that if I had a light shining off my hip bone, it would be hitting the floor about six feet in front of me. I don’t want you to be rolling back on this exercise, you want to just keep a slight forward tilt of the pelvis. In this position, take a breath in, and exhale, leading with the heel, lift, two, three, and back down. If you find yourself lifting your leg quite up high, you can pretty well assure yourself that you’ve cheated. What happens is, if we lift up high, we’re using our front hip flexors and quadriceps rather than our hip abductors, which are in here and attached right close to a common fracture site. We really want to get these glute muscles working here, and that really makes us much more stable when we walk and do a lot of exercises. Again, hips slightly forward, focus on leading with the heel, hand in front, breath in, slowly, gently tighten your tummy as you lift the leg, holding and exhaling, and slowly back down. And time to repeat, breath, and back down. Here are a two tips that might help you when you practice the exercise. If you hips are wider than your waist, you should place a small pillow or rolled towel in the space between your pelvis and rib gage as illustrated in the two immediate photos above. Your top heel should remain in contact with the wall throughout the exercise. The video below provides additional guidance for Physical Therapists when they work with patients and want to use the side lying leg lift exercise. The side lying leg lift with weight is a strength exercise that targets the abductor muscles and the hips. If you find this exercise too advanced, you should try the side leg lift exercise without weights (above). The side lying leg lift with weight is an intermediate level strength training exercise. You’ll need a weight to place on your ankle and a small roll to go underneath your waist. Lie on your side and ensure that the towel is right at your waist fold. Then you can place your arm underneath your head or a pillow. Your want to have your bottom leg comfortably bent, your top leg is in line with your trunk, and up against the wall or some sort of cuing for you to bring yourself back and keep your leg in that alignment with your torso. So, in this position, roll your hips slightly forward. If you had a headlight on your forehead, you’d want to be aiming toward about six feet in front of you so that you’re not blinding people coming into the room. Keep your leg back, hold, two, three, and slowly back down. And one more time, breath in, lift leading with the heel, two, three, and back down. If you find that you have purchased a weight that only allows you to get through six repetitions, you’re going, “Whoa, it’s really heavy,” well, there’s nothing to preclude you from taking that weight and actually starting with it higher up the leg. You may want to actually purchase a weight that’s a little bit heavier and start with your leg lifts with the weight closer to the knee. The shorter the lever, the closer the weight is to the muscle that’s working, the less heavy it’s going to feel, but it might be just the right intensity for you initially, and as you get stronger, you gradually move the weight away from the muscle you’re working so that, eventually, it’s back at your ankle. If your hips are wider than your waist, place a small pillow or rolled towel in the space between your pelvis and rib cage. The closer to the ankle the weight is located, the heavier it will feel. If you are unable to do the required number of repetitions with the weight at your ankle, start with it resting on your thigh above the knee and slide it down as you get stronger. 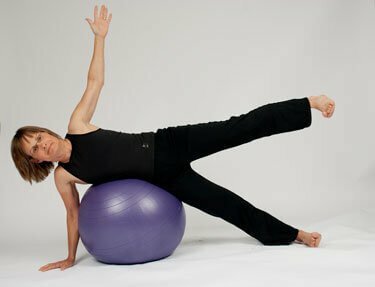 The Side Lying Leg Lifts on Stability Ball is a strength exercise from the Exercise for Better Bones program specifically designed for the Elite Level. The exercise targets the hip abductor muscles. It also targets the bones in the wrist and hips. This exercise should only be done with the correct sized and safe burst resistant physio or exercise ball. The following are the instructions for the side lying leg lifts on a stability ball. You need the ball to be the right size for you. If you’re not 100% sure please go refer back to the ball size recommendations. You want to be in side kneeling position. Place the ball right up against one hip. You’re going to take your hand and place it right underneath your shoulder. Tuck the ball with your elbow, so you’re tucking the ball with your hip and your elbow. You’re now going to step on the outside of your ankle so your hand and your foot are in the same line. Other leg sits on top. If this is a new exercise for you, you can place your hand on the ball for a little additional stability. Your head’s in line with your body, so it’s a nice neck strengthening exercise as well. You’re going to take a breath in and leading with your heel, lift up towards the ceiling and back down. And again, lift up towards the ceiling and back down. If you want to make this exercise a little harder you can incorporate the arm and leg lift into the exercise. Then that’s it for the elite level side lying leg lifts on a stability ball. I am trying to design a routine with the exercises on your videos. Do I have to follow a certain order? How can I work out a 3 day plan with your exercises? I feel overwhelm with all the choices. I started with 2 of the warm up exercises,(lateral lunge and Bird nod), the dumbbell walking lunge, followed by the squats with weights, the hip raises on the ball, the exercises for spine, swiss ball pull over with 2 dumbbells, steps push ups, side lying leg lift on stability ball. I love them all. And with your instructions they are easy to follow. CONGRATULATIONS for a great program. I also did 20 reps of each one. Hi Lizette, The routines are designed for you. If you have my book there is a link to the programs and you can choose between a three times a week routine or a six times a week routine. It’s all done for you. Have a look at them and download the one that works best for you. Sets and reps are also listed in the programs. Happy working out. Go get stronger!! I have hyper mobility in some of my joints and find that increasing the weights causes pain, which can take a long time to heal. Would doing more reps with lower weights make any difference to my osteoporosis?